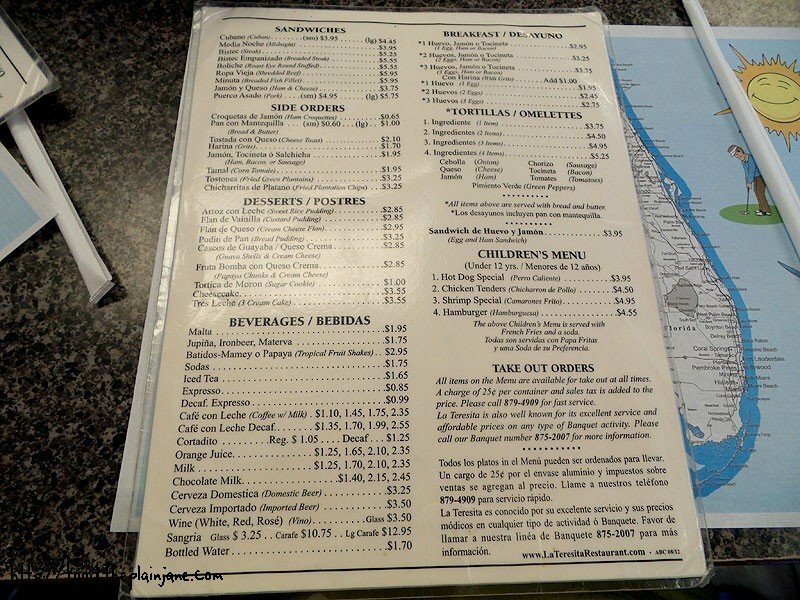 On our first morning in Tampa, Chris took us to La Teresita, a Cuban restaurant in Tampa. We went to the cafeteria portion (which is open 24 hours a day Thursday – Saturday) where there are U shaped tables and bar stools for sitting. You can kind of see how it’s set up in this photo (but only a little bit). We’re sitting at the corner with Jake in the middle of us at the curved part of the U shape. It’s a pretty simple setup – nothing fancy here. There’s also a sit down restaurant with real tables as well as a bakery. Here’s one side of the menu. And here’s the other side. 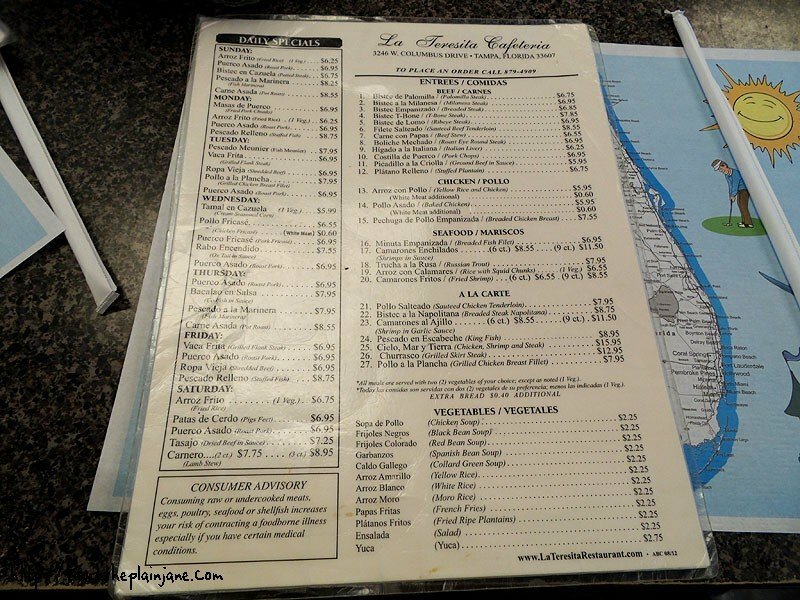 They have simple breakfast offerings, pressed Cuban sandwiches and other items. We mostly stuck with the sandwiches. If they didn’t have the translation next to this as cheese “toast” I probably would have thought this was a tostada – like with a crunchy tortilla with cheese on top. Chris did all of the ordering though and told us this was Cuban Cheese Toast. 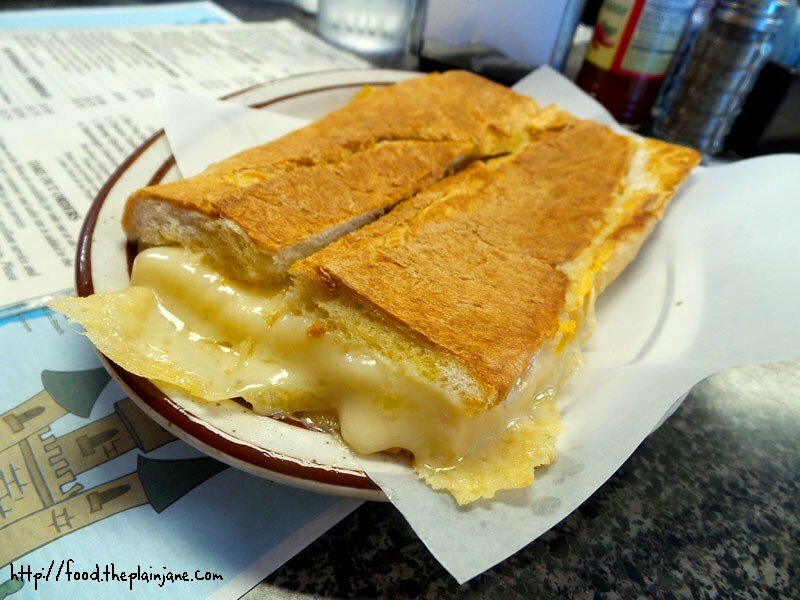 They use Cuban bread which is pressed and grilled with butter and Cuban cheese inside. Chris wasn’t sure what kind of cheese it was (other than Cuban cheese). It melted very nicely and had a milder taste to it – it reminded me a little bit of Baby Jack cheese. The bread was fresh and had a nice crispness from being pressed. I could probably eat this every day. 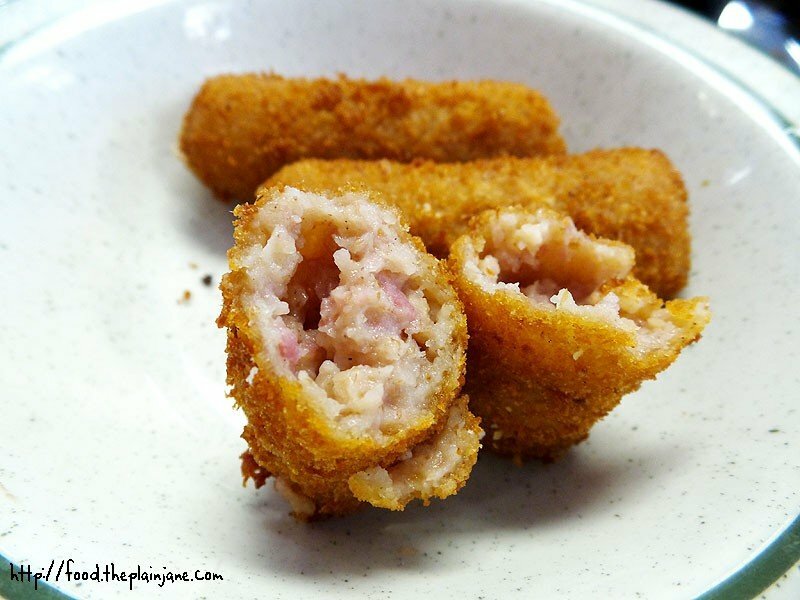 I originally thought these were ham and cheese croquettes but I was wrong – it’s only ham! Looking at a few recipes revealed to me the process of making these – they are made with ground ham and spices with either crackers or bread crumbs for the outer coating. The inside of these very much had the consistency of my great grandmother’s pork stuffing recipe – a creamy, meaty concoction – with a nice outer crunch from the breading and frying. I adored the flavor and texture both inside and out and I had these a few times during our trip. I liked them so much that I asked for us to revisit here on our last day so I could have them one more time! I spied a few recipes online so I might have to take a crack at making this one, I loved it so much! Chris insisted that we get the large sandwich because the small one is really small but damn… this sandwich is huge, especially for such a little price tag! 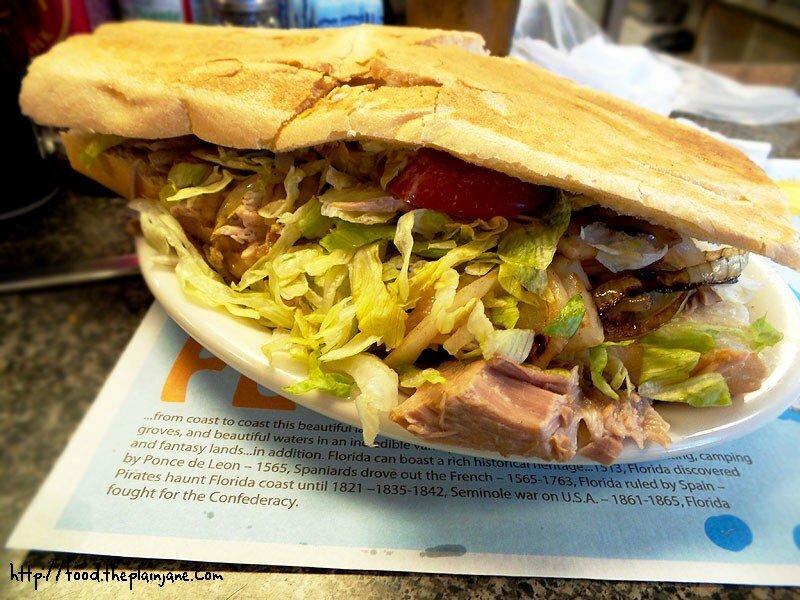 It’s filled with roasted, seasoned pork, onions, lettuce, and tomatoes. It’s on the same Cuban bread that’s used for pretty much everything here. The pork was mostly tender but there were a few “dry” spots but the overall flavor was very good. 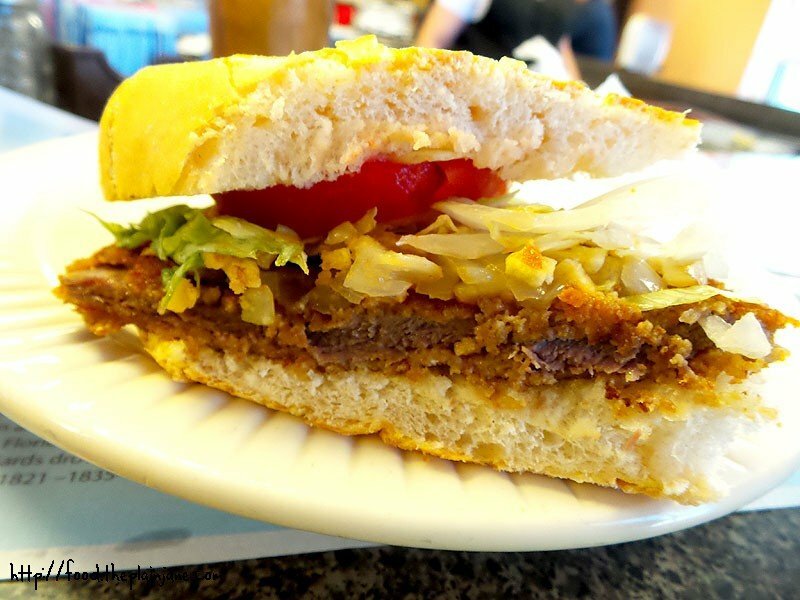 This is a breaded steak sandwich with the same toppings as the pork sandwich. The steak here is thin (maybe pounded out?) and breaded and seasoned – pretty much like milanesa steak. 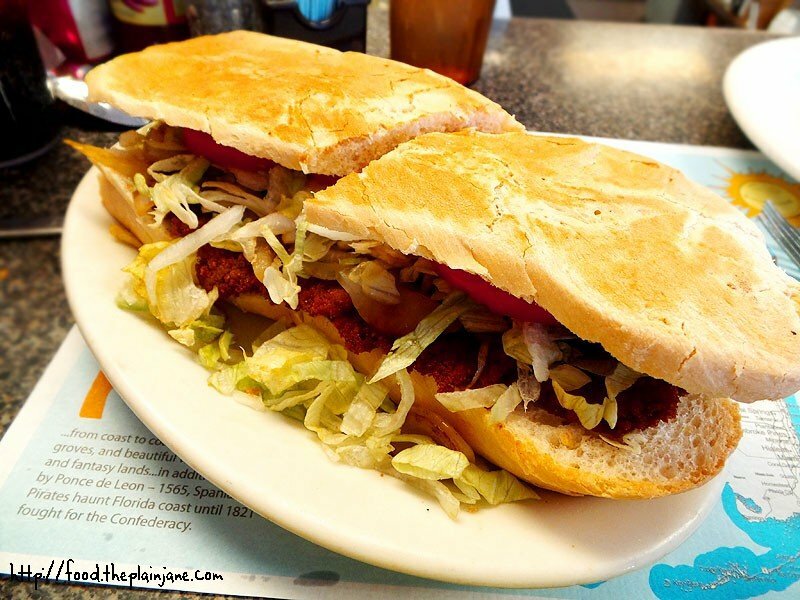 I really enjoyed both sandwiches that first visit but maybe the breaded steak a tiny bit more since I love breaded steak (reminds me a bit of veal parmigiana). 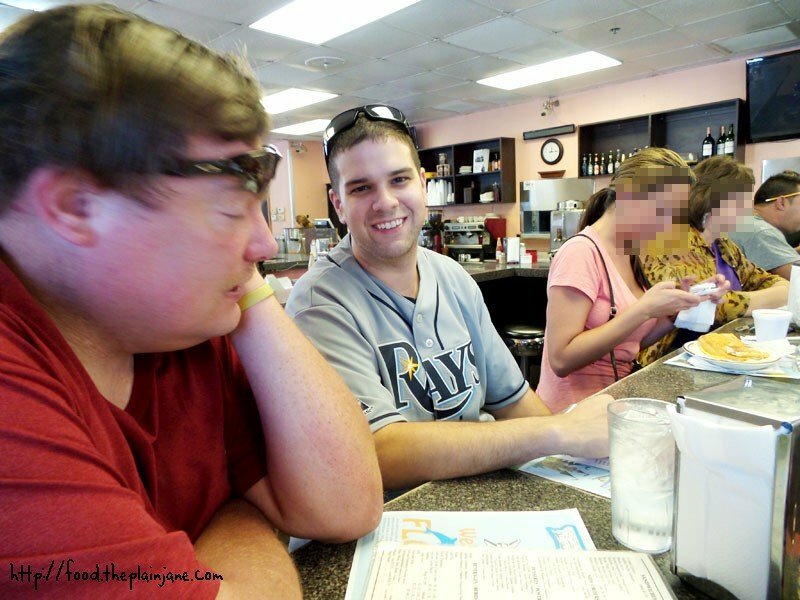 This is from our second visit which happened on our very last day in Florida! On the menu I saw there was something called “Guava Shells & Cream Cheese” and I wondered what in the world that was. Chris asked in Spanish what it was and he tried to explained it but I don’t remember what he said… but one thing lead to another and we ended up getting these guava and cream cheese pastries that were so flaky and delicious! The guava and cream cheese together was a delicious combination. I haven’t really had guava before but this one was a touch sweet. 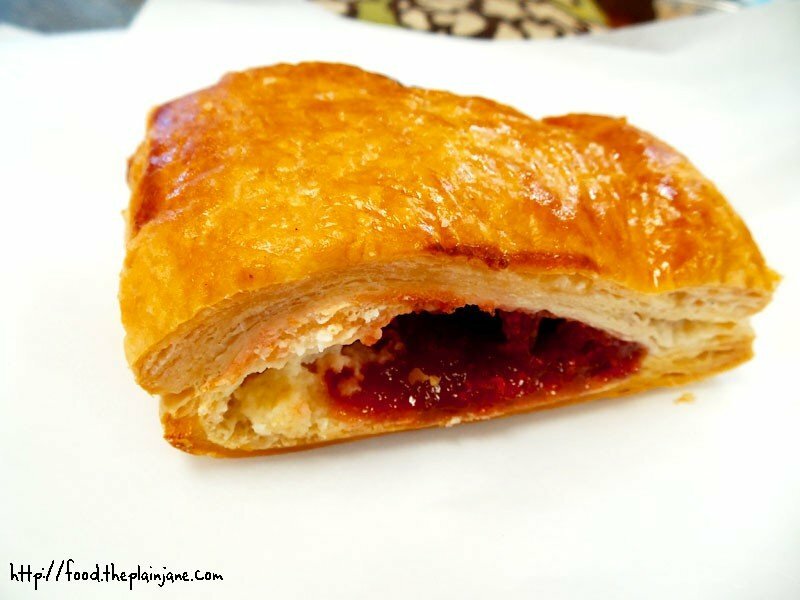 I love love loved the flaky layers, it was a bit like a filled croissant. 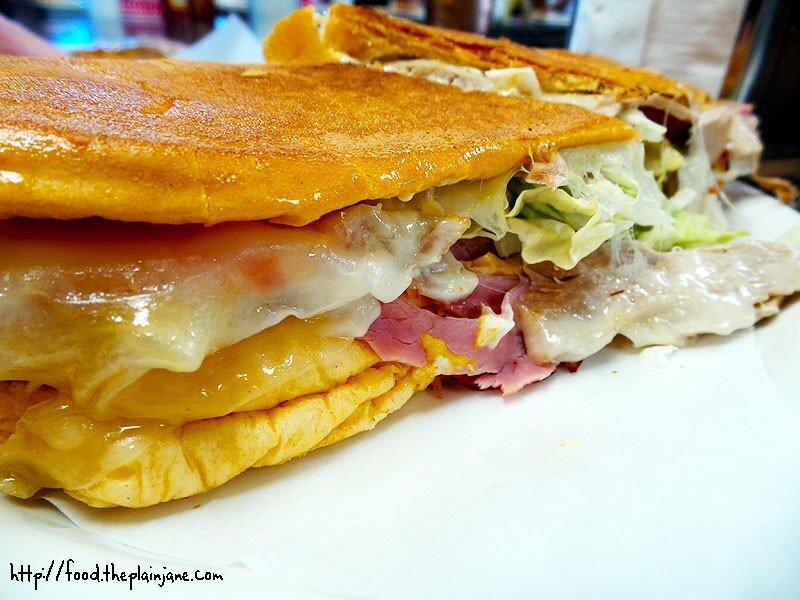 The media noche sandwich is very similar to the Cuban sandwich except that the bread is made on a sweeter, softer egg dough bread (similar to Challah) instead of the crustier Cuban bread. I really really liked the bread on this one, I liked the softness of the bread plus that slightly sweeter taste. 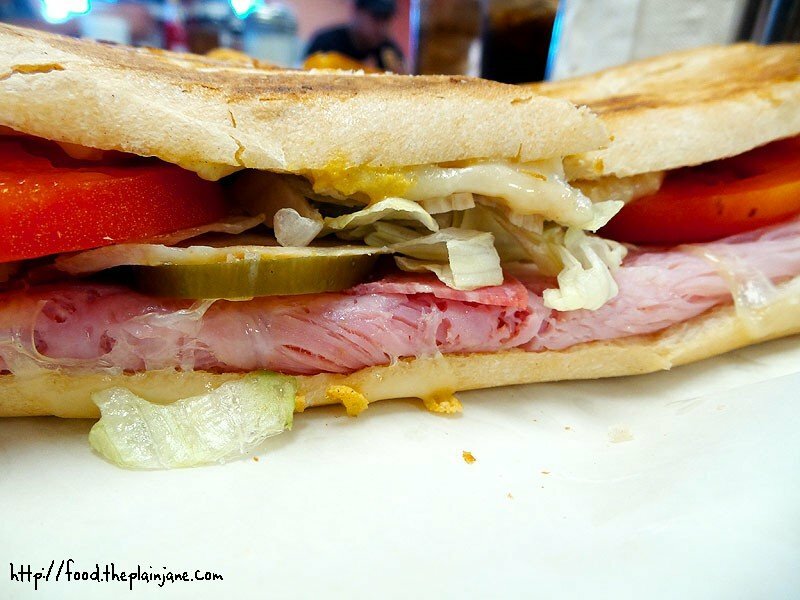 It’s got ham, pork, cheese, lettuce, tomato and pickles on it. No pickles for me, like, ever man. Once those were removed I happily munched on this. You can’t really tell from this angle but this is a pretty freakin’ big sandwich to me! What you see up there is only HALF. I can’t believe it costs less than four dollars. Again, Chris said the small is “really small” so I think his idea of “small” and mine are totally freakin’ different because HELLO LARGE SANDWICH. There’s like ham and other meats in here. I totally don’t remember what. But it was really good, too. I just really like the fresh Cuban bread which is a little similar to French bread but not quite as tall or fluffy as that. 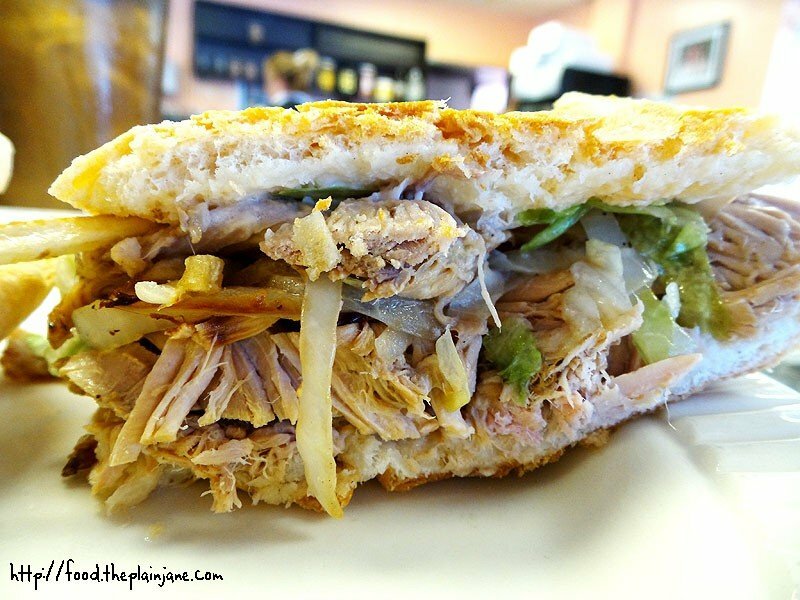 I loved how all of the sandwiches are pressed – it looks like they stick a brick on there or something to weight the whole thing down to get it completely flat with an even grill mark across the top. 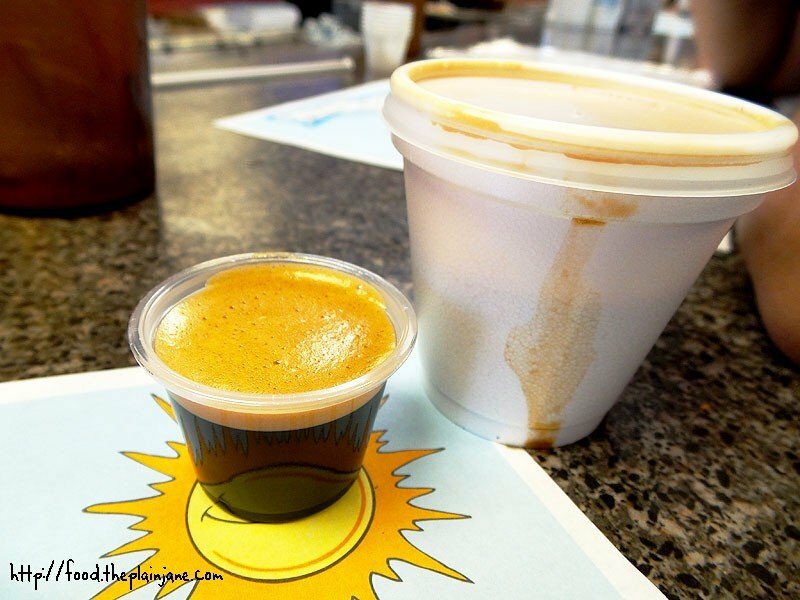 “A Colada is when cuban coffee is made on the stovetop in a coffee maker. Once the coffee boils you pour a small bit into your mixing/serving glass with a few spoons of sugar. Pour a small amount of coffee in and begin to stir immediately while the sugar turns into a pasty substance. I loved that you got it in little shots and that it was already sweetened a bit. This thing is INTENSE and very strong and I LOVED it. This was my second crack at it since I initially had my first “shot” in Miami and wanted to try it here before our departure. It’s rich, very bold, only a hint of sweetness and it really wakes you up quick! I had like 2 or 3 little shots and was pretty happy my tummy didn’t get mad at me for having hot coffee (thank you, tummy). OMG, those sandwiches are HUUUUGE! Everything looked so good. I would have liked that breaded steak too! Now I’m really curious about that ‘colada’ coffee! Hi CC – I know, the sandwiches were so big! Luckily we shared everything (though we still had leftovers). And I loved the prices, too haha! So cheap and good. You had hot coffee!!! Yes!! So happy to hear that it was a success and it didn’t blow up your stomach. 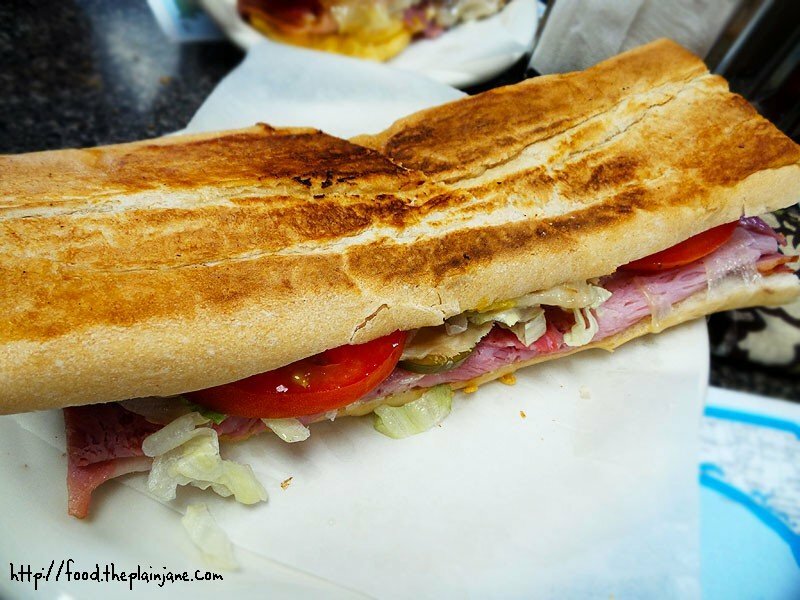 That was a HUGE cuban sammy! Jeez is it because we’re chicks and hence have a different meaning of a really small sandwich. Me thinks not. What a great value. I seriously want to switch friends with you for a day. Not that I don’t love my friends. But every time I eat with friends, they never over order. Whereas I want to order everything on menu. I’m so jealous of your meals with your buddies. Yeah, since we never ordered the small sandwich I really doubted it was that small because the large was like, way too much. The three of us shared everything to maximize the number of things we ate and tried. Usually we would order two entrees and an appetizer and that was plenty. We would all eat just enough and have no leftovers (yay). Thought we totally over order at places, too (like bakeries – because “mmm, carbs” haha).